Back when the VESA announced the DisplayPort alt mode for USB Type-C, one of the most common questions was whether we’d see USB ports on a video card. As a standards body the VESA couldn’t answer this question, but ultimately whether that would happen would be up to the manufacturers. Now at Computex, MSI is showing off what looks to be the first high-end video card with a USB-C port for display purposes: the MSI GTX 1080 Ti GAMING X 11G Graphics Card with USB Type C.
The USB-C equipped card is virtually identical to its regular GTX 1080 Ti GAMING X 11G counterpart, except dropping the final DisplayPort for the USB-C port, leaving it with 2 DisplayPorts, a DVI-D port, an HDMI port, and the USB-C port. From a feature perspective, thanks to DisplayPort alt mode, a USB-C port is just as good as a DisplayPort for DP signaling purposes (though it should be noted that you lose TMDS backwards compatibility), which means the switch to a USB-C port doesn’t cost anything, but it also doesn’t necessarily gain anything. What MSI isn’t commenting on right now is whether this USB-C port will offer anything besides DisplayPort alt mode functionality, such as USB 2.0 data another alt mode. The USB-C alt mode standard requires that the 4 USB 2.0 pins remain untouched, but strictly speaking they don’t seem to be necessary for alt mode to work since that’s handled by the CC pins. However DisplayPort monitors using USB-C for all of their connectivity, such as the LG UltraFine 21.5, will not appreciate the lack of USB data. In which case USB 2.0 data is required for maximum compatibility. Ultimately, placing a USB-C port on a high-end video card serves a few different purposes for MSI. In the present, it makes the card fully compatible with USB-C monitors like the aforementioned UltraFine, along with any other display setups where you may want to quickly swap between said video card and a USB-C equipped laptop. However in the longer term, I suspect this may be the first move in a larger (and very long) transition to USB-C for all display connectivity. Part of the purpose for the USB-C standard – and why groups like the VESA embrace it – is that everyone wants to solve the increasingly difficult external bandwidth problem once, and then share the technology (and a common port) rather than each group implementing their own solution. 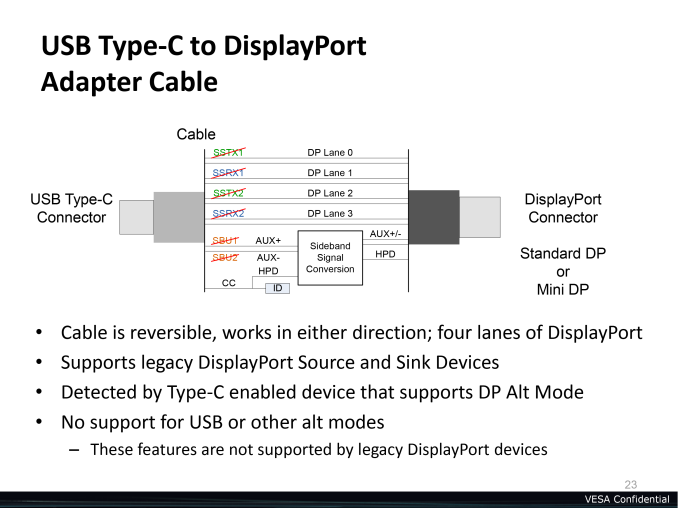 The DisplayPort and its associated cabling are coming up on a decade old and have been through 3 revisions, with the latest standard supporting ~30Gbps of cable bandwidth. Meanwhile the USB-C port and cabling system is intended to support 80Gb/sec (or more) of cable bandwidth. So while nothing has been officially announced at this time, USB-C on video cards may not just be a DisplayPort alternative, but may end up being the future of display connectivity itself.